The M'goun Mountain, also known as Ighil Mgoun, is located in Central High Atlas at 4068 metres and is the fourth highest peak of the Atlas Mountains. The mountain is inhabited by the Ait Atta tribe who graze their goats and camel herds at the foot of M'goun during the summer months. The local Berber tribes live in small communities and lead semi-nomadic lives, utilizing the forests and amazing cultivated lands such as Ait Bougmez Valley and Rose Valley. The wildlife that can be seen in these mountains include hare/rabbit,fox, toads,frogs, vultures, and the rare Bonelli-eagle. A few of the trees include junipers, oak tree, scrub willows, and poplars. Please contact us for more information on this tour or to have us customize a tour for you. 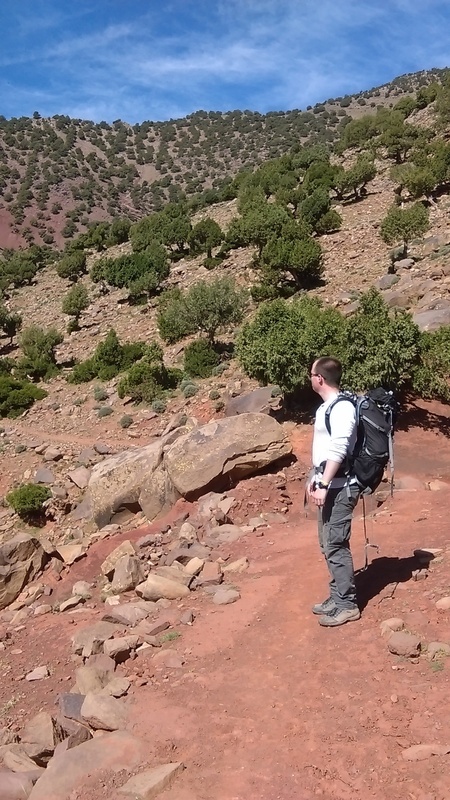 Day 1: Transfer from Marrakech to Ait Bougmez Valley (heureuse valley) via Azilal. Overnight in Agoutti village. 7 hour of drive. Day 2: Walking via Ait Said Village to arrive your camp in Arous Village. 4 hour of walk. Day 3: Climbing the Aghouri mountain pass at 3,450m. Camping in Tarkedditplateau. 7-8 hour of walk. Day 4: Climbing the M'goun peak (4068m) is optional, camping in Azib N'Oulilimt . 8-9 hour of walk. Day 5: Trekking day to Tighramt N’Ait hamd through Aflalal. Camping. 5 hour walk. Day 6: Hiking via Tizi n’Ait Imi 1960m, the happy valley of Ait Bougmez. Overnight in guesthouse. 6 hour of walk. - Tipping for local team ( guide, driver, Muleteers) which is part of Moroccan culture. Day 1: Transfer from Marrakech to the sart of the valley and overnight in berber guest house at Ait Ochi village. 5 hours of drive includes some stops along the way fir photos and lunch. Day 2: walking along the valley and visiting the cereal storage of Sidi Moussa. and overnight in guest house at Ifrane village. 4 hours of walk. Day 5: lovely day walking across fabulous fields and meet villagers working in their groves. Visit centre of the town Tabant where you will be picked up and drive to Azilal town where you will enjoy lunch before you drive back to Marrakech. 1 hour of walk and 4 hours of drive. Day 1 : arrival day to Menara airport and transfer to your hotel . The rest of day will be just relaxing and free time to explore city by yourself . Day 2 : transfer to Ait Bougmez valley via Azilal city .We will have stop in waterfalls of Ouzoud for beautiful visit then drive to Azilal for picnic lunch. night in guest house at Timmt village.5 hours of drive. Day 3 : trekking from Timmitvillage to Ikiss N’arous 2260m .today is wonderful hiking dayacross Berber villages and green fields of apples. Camping,5 hours of walk . Day 4 : full day walking to Tarkeddet plateau 2960m. After having breakfast , We take our way uphill to get the mountain pass which at 3400m and then walking downhill for an overnight in camp .5 hours of walk . 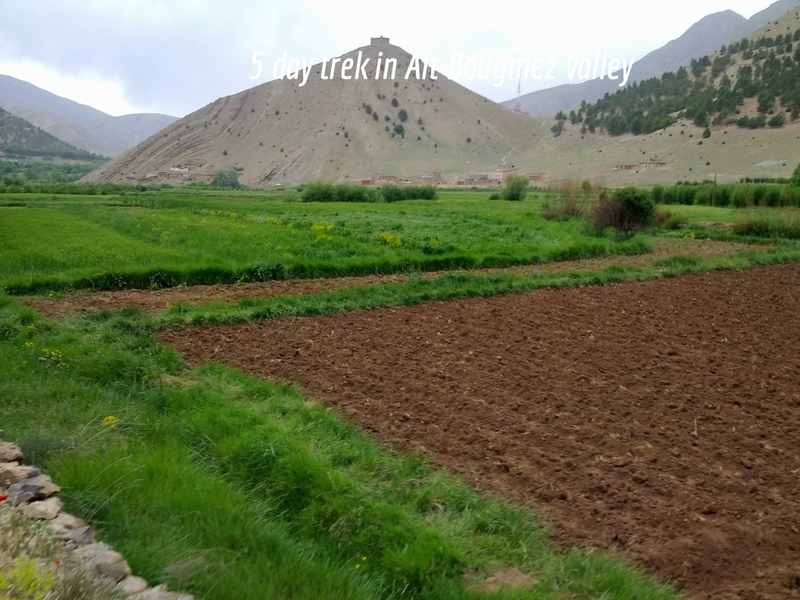 Day 5 : full day hiking to the beginning of Tassaout valley2000m ( Tasgayoualt village )via Asdram mountain pass.We are going have great walk throughout pastures of M’goun mountain and great views of the beautiful Tassaout. Fantastic scenery of the area. Night in camp at Ait Ali N’Itto village, 6 hours of walk. Day 6 : lovely day hiking along Tassaout valley2000m walking on water from time to time .this journey is great across the gorges and the several picturesque Berber villages. overnight in guest house . 7 hours of walk . Day 7 : beautiful full day trek via an authentic Berber village of Megdaz which is one of the oldest Berber villages in Morocco.Its massive Kasbahs will give you an idea of the Real Berber architecture of the area. Then we continue our journey through colourful mountains. Overnight in camp in Tagourt village . 6 hours of walk. Day 8 : walking day to Taoudja pastures,today is just another splendid journey crossing grey atlas mountains and you are in nowhere in middle of the nature. Night in camp . 5 hours of walk. Day 9 : fantastic walking day from Taoudja to Tamda lake, the hike today will take us through beautiful mountains. Overnight nearby this gorgeous lake. Day 10 :Hiking to Tighza valley,relaxing afternoon in guest house. Day 11: Short walk to Anmmeter village and Transfer back to Marrakech, drop you off in your hotel in Marrakech new town.